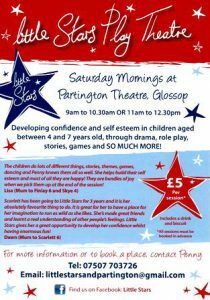 Partington Theatre runs workshops for our younger members to encourage and introduce young people to the art of dramatic performance. Led by dedicated, experienced and fully qualified professionals, our three youth workshops are open to all from age seven upwards. Tuesdays 4.30 – 6.00 pm £4 per session. Thursdays 6.00 – 8.00 pm £5 per session. To develop dramatic skills and techniques. To develop a positive awareness of others. To learn to work positively and productively with others. To learn that effective performance in public requires a structured and disciplined approach, and when opportunity arises gain experience of public performance. is a FRIDAY AFTERNOON, 4:30pm – 6:00, club for 5- 6 year-olds. Drama is combined with play and fun to develop your little one’s concentration, imagination, social and creative skills. Price £5.00 per session. For further information or to book a place contact Jayne Skudder on 01457 867141.